matter of days from one of the finest nurseries in the country. Garden visiting in the autumn has special qualities: a restfulness as you sense a garden beginning to settle into winter repose, as well as a particular softness and clarity to the light as the sun gets lower and the days draw in. Through the weeks of late September, October and into November, we are fortunate that a number of gardens open all over the country in aid of the National Gardens Scheme (NGS). In some cases, it’s the one and only chance to visit, and they offer undiscovered treats. Paul and Liz O’Neill farm here and, 12 years ago, decided to transform a two-acre field into a gardener’s delight, with an emphasis on deciduous trees for autumn colour, such as acers and liquidambars, borders filled with late-flowering perennials and lots of wonderfully individual touches, such as the willow structures they have made that are like natural sculptures. A far cry from rural Wales is Kingston-upon-Thames in south-west London/Surrey, where, on October 14 this year, an extraordinary historical delight can be discovered at The Watergardens, just off Kingston Hill. During the 1860s, this was the site of Coombe Hill Nursery, owned by the celebrated nurserymen the Veitch family, based in Exeter. James Veitch Jr created a sensational landscape, transforming old gravel workings into a Japanese water garden with ponds and streams, bright red wooden bridges and a connoisseur’s selection of trees and shrubs introduced from Japan. Not surprisingly, the weeks of autumn see the garden at its best, hosted by the residents’ association of the houses and apartments that are part of the property. This year saw the death of one of Britain’s most eminent physicists and astronomers, Sir Bernard Lovell. His scientific work was world-famous through the Jodrell Bank Observatory, which he set up after the Second World War, but few people knew of his love of gardening-in particular, trees-and the fascinating arboretum that he created at his home, The Quinta, next to the Cheshire observatory. I remember visiting many years ago, and as we walked along a narrow avenue of towering lime trees, Sir Bernard explained that he had planted them unusually close together to try and create the sensation of the pillars of a cathedral nave. The trees are outstanding, including national collections of Pinus and Fraxinus (ash), and although the arboretum is open regularly, the autumn zenith is celebrated by a day dedicated to the NGS on October 14. Few places are more quintessentially English than the Malvern hills, and at Perrycroft in Herefordshire, near Ledbury, one of the leading lights of the Arts-and-Crafts Movement, Charles Voysey, created the house and garden masterpiece of his early career in 1895. Twelve years ago, the property was bought by Gillian and Mark Archer, who have spent the past 10 years lovingly restoring the gardens from a state of advanced dereliction. Now, the yew hedges have been brought back from being trees, paths restored and borders planted particularly for late summer and autumn. The Archers’ work is topped off by the unforgettable view west from the garden’s terrace to the Iron Age hill fort of British Camp, which has always been one of the garden’s most memorable attractions. 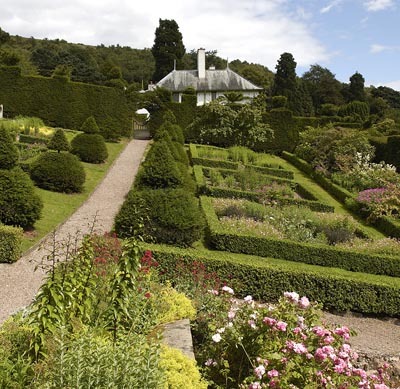 A few miles up the road from Perrycroft is the Picton Garden, attached to a distinguished nursery. Generations of the Picton family have made Old Court Nurseries and its garden famous for Michaelmas daisies, which will be at their best on October 3, 12 and 21 for the NGS. Few nursery owners are held in higher regard than Derry Watkins, who created Special Plants on the Somerset-Wiltshire border near Bath. The hillside position gives spectacular views, if you can tear your eyes away from the garden (which will be open on October 18) and its array of herbaceous plants, most of which, of course, are for sale.